The Pyrenees are a range of mountains in southwestern Europe that form a natural border between France and Spain. They separate the Iberian Peninsula from the rest of continental Europe, and extend for about 267 miles (430 km) from the Bay of Biscay to the Mediterranean Sea. For the most part, the range forms the main crest of a massive barrier between France and Spain. The tiny country of Andorra is found sandwiched between them. The cultural regions Catalonia and the Basque Country extend on both sides of the mountain range, with a northern and a southern area on each side. According to Greek mythology the Pyrenees are named after Pyrene (fire in Greek), the daughter of Bebryx, and a lover of Hercules. It is said she was raped by Herakles and bore a serpent. Terrified, she fled to the woods where she died. Hercules created a tomb for her by piling up rocks thus forming the mountain range of the Pyrenees, named after her. Herodotus placed the setting of this mythological legend on his map of the Oikumene (inhabited earth) as early as 450 B.C.E. 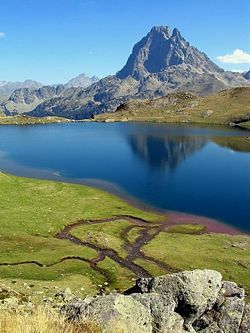 Pico del Aneto, the highest mountain of the Pyrenees. Politically, the Spanish Pyrenees are part of the following provinces, from east to west: Girona, Barcelona, Lleida, Huesca, Navarra, and Guipúzcoa. 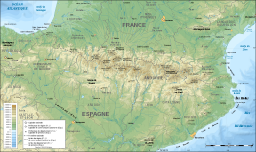 The French Pyrenees are also part of the following départements, from east to west: Pyrénées-Orientales, Aude, Ariège, Haute-Garonne, Hautes-Pyrénées, and Pyrénées-Atlantiques (the latter two of which include Pyrenees National Park). Mont Perdu, Monte Perdido, or Mont Perdut 3,355 meters (11,007 ft). In the western Pyrenees the average elevation gradually increases from the west to the east, from the Basque mountains near the Bay of Biscay of the Atlantic Ocean. In the eastern Pyrenees, with the exception of one break at the eastern extremity of the Pyrénées Ariégeoises, the mean elevation is maintained with remarkable uniformity until a sudden decline occurs in the portion of the chain known as the Albères. The Pyrenees are older than the Alps: their sediments were first deposited in coastal basins during the Paleozoic and Mesozoic eras. Between 100 and 150 million years ago, during the Lower Cretaceous period, the Bay of Biscay fanned out, pushing present-day Spain against France and putting large layers of sediment in a vise grip. The intense pressure and uplifting of Earth's crust first affected the eastern part and stretched progressively to the entire chain, culminating in the Eocene epoch. The highest waterfall is that of Gavarnie (462 m or 1,515 ft), at the head of the Gave de Pau; the Cirque de Gavarnie, in the same valley, is perhaps the most famous example of the cirque formation. Low passes are lacking, and the principal roads and railroads between France and Spain run only in the lowlands at the western and eastern ends of the Pyrenees, near sea level. Between the two ends of the range, the only two notable passes are the Col de la Perche, between the valley of the Têt and the valley of the Segre, and the Col de Somport or Port de Canfranc, where there were old Roman roads. A notable visual feature of this mountain range is La Brèche de Roland, a gap in the ridge line, which in legends was created by Roland, a character in medieval and Renaissance literature and chief paladin of Charlemagne. It is thought that the title character of the early twelfth-century Song of Roland, which recounts his final stand against the Vascones (an ancient people believed to be the ancestors of the present-day Basques) during the Battle of Roncevaux Pass, is based on a real person who died in that battle in 778. The metallic ores of the Pyrenees are not in general of much importance now, though there were iron mines long ago. Coal deposits capable of being profitably worked are situated chiefly on the Spanish slopes, but the French side has beds of lignite. The open pit of Trimoun (Ariège) is one of the greatest sources of talc in Europe. Mineral springs are abundant; especially noteworthy are the hot springs, which are sulphurous and mostly situated high, near the contact of the granite with the stratified rocks. The lower springs are mostly selenitic. The amount of precipitation, including rain and snow, is much greater in the western than in the eastern Pyrenees, because of the moist air that blows in from the Atlantic Ocean. After dropping its moisture over the western and central Pyrenees, the air is usually dry over the eastern Pyrenees. This all leads to a marked contrast between different sections of the mountain range in more than one respect. Some glaciers are found in the western and especially the snowy central Pyrenees, but the eastern Pyrenees lack glaciers because not enough snow falls there to cause them to form. The glaciers are confined to the northern slopes of the central Pyrenees, and do not descend, like those of the Alps, far down into the valleys, but have their greatest lengths along the direction of the mountain chain. They form, in fact, in a narrow zone near the crest of the highest mountains. As in the other great mountain ranges of central Europe, there is evidence of a much wider extension of the glaciers during the Ice ages. A still more marked effect of the preponderance of rainfall in the western half of the chain is seen in the vegetation. The lower mountains in the extreme west are wooded, but the extent of forest declines eastward, and the eastern Pyrenees are wild and barren, all the more so since it is in this part of the chain that granitic masses prevail. There is a change, moreover, in the composition of the flora in passing from west to east. In the west the flora resemble those of central Europe, while in the east they are distinctly Mediterranean in character, though the difference of latitude is only about 1° on both sides of the chain from the center, whence the Corbières stretch northeastward toward the central plateau of France. The Pyrenees are relatively as rich in endemic species as the Alps, and among the most remarkable instances is the occurrence of the monotypic genus Xatardia (family Apiaceae), only on a high alpine pass between the Val d'Eynes and Catalonia. The genus most abundantly represented in the range is that of the saxifrages, several species of which are endemic here. The Pyrenean ibex became extinct in the year 2000; the native Pyrenean brown bear was hunted to near-extinction in the 1990s, but it was re-introduced in 1996 when three bears were brought from Slovenia. The bear population has bred successfully, and there are now believed to be about 15 brown bears in the central region around Fos, but only four native ones are still living in Aspe valley. Of the 107 species of mammals in France, 75 live in the Pyrenees, including the Pyrenean chamois or Isard, otters, ermine, stoat, pine marten, wild boar, and fox. Among the birds are golden eagles and the endangered lammergeiers, or bearded vultures. In their fauna the Pyrenees present some striking instances of endemism. The Pyrenean desman (an aquatic mammal related to moles) is found in some of the streams of the northern slopes of these mountains, but the only other members of this genus are confined to the rivers of the Caucasus in southern Russia. The Pyrenean euprocte (Euproctus pyrenaicus), an endemic relative of the salamander, also lives in streams and lakes located at high altitudes. Among the other peculiarities of Pyrenean fauna are blind insects in the caverns of Ariège. Livestock are brought to the Pyrenean pastures in the summer for grazing. In the Pyrénées-Atlantiques where this activity is geared toward the production of cheese, shepherds live in the huts in the high summer pastures from May to September and produce Pyrenean Ewes Cheese. In the Hautes-Pyrénées on the other hand, pastoralism is geared toward quality meat production. By the second half of the ninth century, three political subdivisions (marches) existed in the eastern Pyrenees: Toulouse (green), Gothia (blue), and Hispania (pink). At times they were placed under one authority and at other times not. 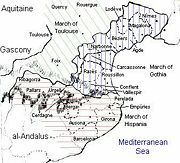 The Marca Hispanica (or Spanish March, also March of Barcelona) was a buffer zone beyond the province of Septimania, created by Charlemagne in 795 as a defensive barrier between the Umayyad Moors of Al-Andalus and the Frankish Kingdom. It was known as the Upper Mark by the Caliphate to the south. In its broader meaning, Marca Hispanica refers to a group of early Iberian lordships or counts created by the Franks, of which Andorra is the sole autonomous survivor. As time passed, these lordships merged or gained independence from Frankish imperial rule. 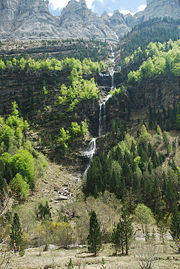 The area broadly corresponds to the region between the Pyrenees and the Ebro River. The local population of the March was diverse, including Iberians, Basques, Jews, and Goths who had been conquered or subjugated by the Muslim emirate to the south or the Frankish Empire to the north. The territory changed with the fortunes of the empires and the feudal ambitions of those, whether the counts or walis, appointed to administer the counties. Eventually the rulers and people of the March became autonomous and claimed independence. Out of the welter of counties in the region emerged the principalities of Navarre, Aragon, and Catalonia. The Marca Hispanica developed as the result of three generations of fighting by the Franks and Muslims (Moors) in the Iberian Peninsula. In 719 the forces of Al-Samh ibn Malik surged up the east coast, overwhelming the remaining Visigoth kingdom of Septimania and establishing a fortified base at Narbonne. Control was secured by offering the local population generous terms, inter-marriage between ruling families, or treaties. Further expansion was halted by defeat in the Battle of Toulouse, and wālis were installed in Girona and Barcelona. The Muslim forces, however, continued to raid the Franks to the north, reaching as far as Autun. Peace was signed in 730 between the victor at Toulouse, the Duke of Aquitaine, and 'Uthman ibn Naissa (Munuza), the Berber deputy governor of Narbonne. A peace treaty was sealed with the marriage of the Duke’s daughter to Munuza. However, when Munuza rebelled against his Andalusian masters, he was defeated and another period of Muslim expansion commenced. In 732, Muslim forces again attacked Gaul and Aquitaine and secured initial victories, including the sacking of Bordeaux. The Duke of Aquitaine failed to secure support from his Frankish overlord, Charles Martel, who wanted to re-impose control over the dukedom. At the Battle of Tours, Charles defeated the Muslim army and repelled the invasion. Seeking to secure the southern boundary of their kingdom from further Muslim attacks, the Carolingian monarchs established a firmer control over Aquitaine. Further campaigns in 736–737 drove the Moors farther south, although Charles failed to recapture Narbonne, which was defended by both its Muslim and Visigoth citizens; however, in 759 Narbonne fell to Pippin, Charles’s son. Pippin's son, Charlemagne, fulfilled the Carolingian goal of extending the defensive boundaries of the kingdom beyond Septimania, creating a strong barrier state between the Muslim Caliphate of Iberia and the Frankish Kingdom. Andorrans are a minority in their own country; Spaniards, Portuguese, French, Britons, and Italians make up two-thirds of Andorra's population of 83,137 (2007 estimate). Tradition holds that Charles the Great (Charlemagne) granted a charter to the Andorran people in return for fighting against the Moors. The Basque Country had a population of about 3 million as of early 2006. The population density, at about 140/km² (360/sq. mile) is above the average of Spain or France, but the distribution of the population is fairly unequal and is concentrated around the main cities. The Greater Bilbao metropolitan area contains one third of the total population, while most of the interior of the French Basque Country and some areas of Navarre remain sparsely populated; density culminates at about 500/km² for Biscay but goes down at 20/km² in the northern inner provinces of Lower Navarre and Soule. A significant majority of the population of the Basque Country lives inside the Basque Autonomous Community (about 70 percent of the population), while about 20 percent of the population lives in Navarre and less than 10 percent in Northern Basque Country (France). Languages spoken in the area are include Spanish, French, Catalan (in Catalonia and Andorra), and Basque. Also spoken, to a minor extent, are the Occitan language (the Gascon and Languedocien dialects in France, and the Aranese dialect in the Aran Valley), and Aragonese. 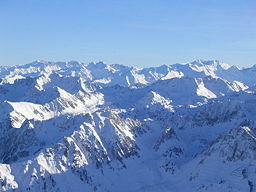 Both sides of the Pyrenees are popular locations for winter sports such as alpine skiing and mountaineering. There are numerous ski resorts. The Pyreenees are also a popular place for both European and North African athletes to do high-altitude training in the summertime, such as by bicycling and cross-country running. In the summer and autumn, the Pyrenees are normally featured in two of cycling's epic grand tours, the Tour de France held annually in July and the Vuelta a España held in September. The stages held in the Pyrenees are often crucial legs of both tours, drawing hundreds of thousands of spectators. 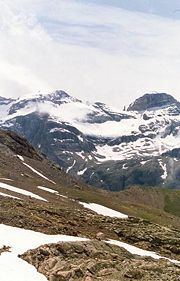 Three main long-distance trails run the length of the mountain range: the GR 10 across the northern slopes, the GR 11 across the southern slopes, and the HRP, which traverses peaks and ridges along a high-altitude route. In addition, there are numerous marked and unmarked trails throughout the region. Whitewater rafting attracts adventurous tourists. The Pirena is a dog-mushing competition held in the Pyrenees. The glaciers on the Spanish side of the Pyrenees are melting fast. A 2004 study by a group of Spanish scientists found that their total surface area dropped from 1,779 hectares in 1894 to a mere 290 hectares in 2000, representing a drop of 85 percent; 52 percent of the melt occurred in the previous 20 years. As these trends continue, observers predict that surface area could be just nine hectares by 2050, with the ice disappearing completely somewhere between 2050 and 2070. The Pyrenean glaciers were principally formed during the so-called Little Ice Age (often taken as 1540-1880 C.E.) and have been slowly melting ever since its end. As the trend continues, The Pyrenees are likely to experience milder winters and hotter, drier summers. These conditions are likely to reduce the snow cover on the mountains and thus decrease participation in winter sports in the future. It is not clear at this point how much of the accelerated melting of the glaciers is due to natural climate change or to global warming due to carbon emissions. ↑ U.S. State Department. Principality of Andorra Profile Retrieved February 21, 2009. ↑ Datutalaia. Euskal Herriko Datuen Talaia Retrieved February 22, 2009. ↑ Instituto Nacional de Estadistica. Toda la Informacion Estadistica Retrieved February 22, 2009. ↑ Iberianature. Glaciers in Spain Retrieved February 21, 2009. ↑ Iberianature. Iberia most affected by climate change Retrieved February 21, 2009. This page was last modified on 17 June 2015, at 15:21.